Power purchase costs UP to Kshs27,429 million. Cash balances "decreased significantly duw to aggressive implementation of capital projects"
Company may require government bailout soon. This one is headed to the crooked Me Zero One days, smiling from the sidelines. Thermal generation is expensive.They could try getting an alternative which will bring value.There is no need of using kshs 12 billion only to get kshs 11 billion. Overdrafts facilities is now becoming burdensome.They should look at cheaper options. Do these figures make sense? From the same accounts, customer numbers stand at 6.5M, with monthly standing charges @175,this is over 11B a year. Does it mean that no money is made from electricity sales? No need for bailout currently. In my opinion this is manageable. 1.Negotiating for cheaper power purchase from sellers e.g kengen and others. 2.They can get fuel at a good price from a good company like kenol and others. 3.Forcing the Gok to pay for transmission and distribution costs of its initiated plans like last mile and street lighting. Cash flow has increased to negative 7,743,000,000.This is mainly due temporary overdrafts. They can use the long term debt for these as its repayment will not bring strain to company finances. Your analysis doesn't make sense. Your reasoning is from a fantasy world. They used kshs 12,294,000,000 on fuel to generate thermal.Then they got kshs 11,637,000,000.What is that? They should stop generating thermal.With the 12 bilion they can use 7 billion to ease the cash flow and the balance of 5 billion they can buy cheap power and get more revenue. 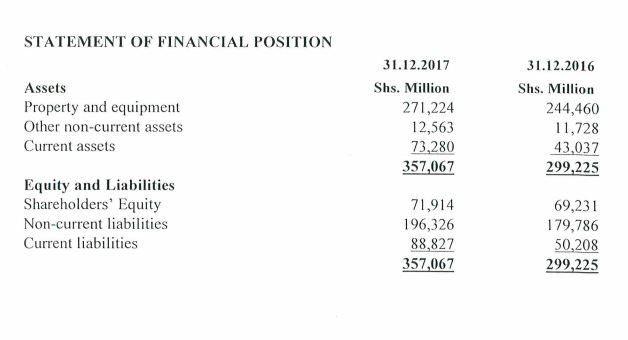 Finance income was kshs 52,000,000.These is an avenue which could be grown to generate more income. This loans of kenya power is there value for money or which projects can one point to where the money has been used. 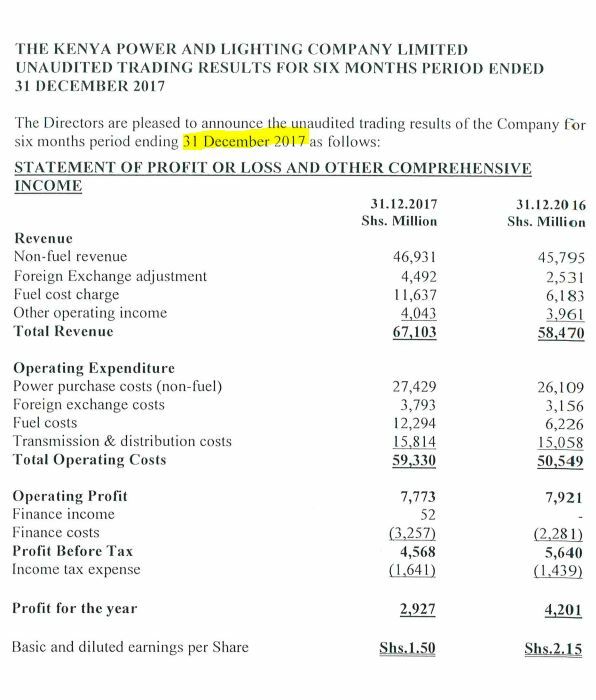 sawa,wacha tungoje full year results in November.I have been going through their current annual report and will continue to do so to get more details.I now have both full year and hy results which i will also continue to peruse.In the full year results,the transmission and distribution costs were high and now the short loans are becoming a burden.Lets wait and see what next. with economic growth at >5% to see electricity sales growing at 2.3% means Kenya power is heading for the ICU. I would expect minimum 8% growth in electricity sales for the debt to make sense. Or may the economic growth is not more than 5%. Power consumption is always a very good proxy for GDP increase unless when there is rationing..So 2.3% sales increase is indeed cause for serious concern.